Actually the result is quite close to the original Sankey diagrams, with similar colours, arrow routing, and even the same fonts. “I lightened the colors on the input boxes (had to do it), but otherwise I think my rendition is faithful to the original. I may have stayed too true to flow pipe proportionality. Some of them are so thin they do not print well. This should be addressed. While my pipes are seemingly lined up, they will not survive the chart being resized vertically without some small errors, either gaps in a pipe stack, or overlap. So, if you wish to draw a Sankey diagram with the Microsoft Office package installed on your computer, and enjoy using VBA, you might want to give it a shot. Gabor Doka’s Sankey helper (an Excel macro) is another option. 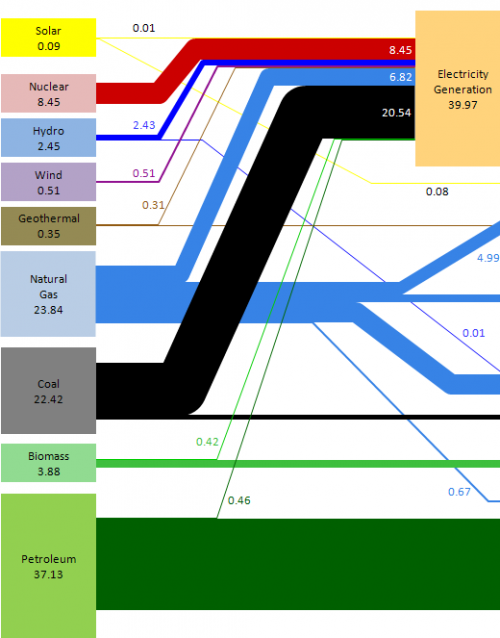 Dedicated Sankey diagram software tools are available. It would recommend one of those, if you need to produce more than one Sankey diagram, or wish to make updates to your diagram and layout adaptations more comfortably. BTW, here is the story on the man behind the Sankey diagrams at LLNL.